Here's an alternate method of tying on the warp to the cloth beam stick. 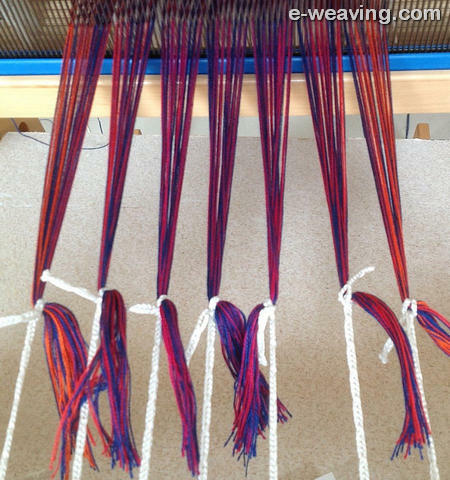 It is similar to how I tie the warps to the warp beam stick which is to bundle the warps and use a larkshead knot to secure the warps. The difference here is that the warps are not knotted, they are simply slipped, in bundles, through the larkshead knot. Then you push on the knot while pulling on the warps to get the desired tension and voila. Although this method suggests using Texsolv cord to make the Larkshead knots, not everyone has Texsolv. Looops of 8/4 cotton carpet warp, all the same size, are a good substitute. If the warp you're using is particularly slippery, you can tie a knot in it to keep it from pulling out of the larkshead knot or Texsolv loop. Try it the next time you warp! What do you have to lose?